The White House is doing damage control after video surfaced Friday of official U.S. maps that erased key areas in Israel, a move that only fueled concern about the Trump administration position on the Jewish state. The maps, shown in a video promoting President Donald Trump's visit to Israel and other Middle Eastern countries, removed the West Bank and Golan Heights area as belonging to Israel. Israel annexed both territories decades ago and considers them officially part of the country. The maps directly conflict with declarations by President Trump affirming his belief that Israel has sovereignty over these areas. They also have added fuel to concerns about Trump walking back campaign promises to bolster the Jewish state. Trump administration officials have questioned whether Israel’s Western Wall area, one of Judaism's most holy sites, is actually part of Israel. The president also has been slow to officially move the U.S. embassy to Jerusalem, a promise he made multiple times on the campaign trail. Senior Trump administration officials told the Free Beacon that the use of these maps was unintentional and that the error has been corrected. Officials are looking into why these maps were used in the first place. "The error was unintentional, and when it was discovered it was immediately removed," according to one senior administration official who spoke to the Free Beacon about the situation. 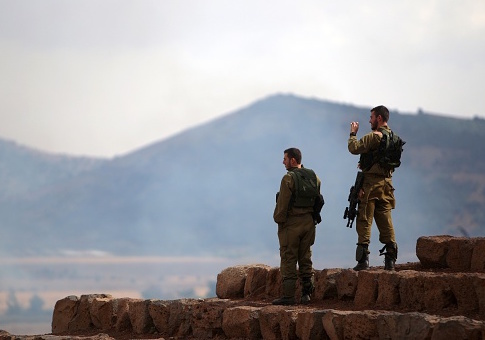 This entry was posted in Issues and tagged Golan Heights, Israel. Bookmark the permalink.